As part of my work with the Wesleyan Media Project (WMP), I am helping to prepare a joint report with the Center for Responsive Politics on the linkages between FEC data and the political ad data at the WMP. 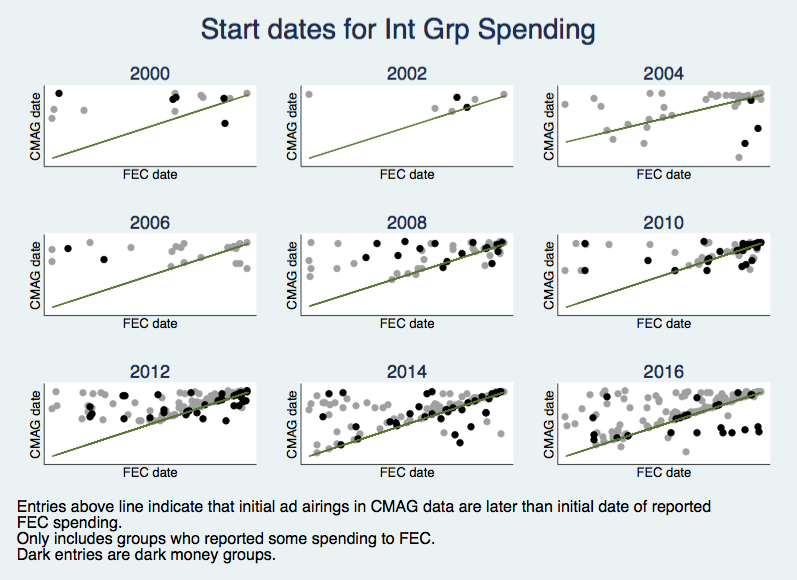 The motivating question is this: if an interest group reports pro-candidate electioneering spending to the FEC, how often does the reported spending match what we have in our database? Is it often the case that an outside group airs ads on television far before reporting to the FEC that they have spent money related to federal elections? If that is the case, there would be lots of electioneering that FEC reporting mandates miss. Below is a graph that compares the initial start date of a group’s spending in both databases. That is, the date the WMP first capture a television ad (featuring a federal candidate) from an outside group against the group’s first reported spending to the FEC. We look at nine election cycles. The data leave out groups that report nothing to the FEC (a separate concern), and we indicate in the graph groups that are “dark money” organizations, those that do not publicly disclose their donors. Any groups above the line appear in the political ad database after reporting something to the FEC, and since the majority of groups fall above the line, the evidence is good news for advocates of transparency. There are, however, a cluster of dark money groups that spend money on ads in advance of any reported spending to the FEC. This is likely not illegal, especially if the ads air sufficiently before a primary or general election and do not call for the election or defeat of candidates, but the results suggest many groups might be spending more money on elections than they report publicly to federal regulators. Fortunately, the number of groups pursuing this approach is small relative to all active outside groups.